Internationally you sometimes see teammates run team tactics in championships races. It requires one teammate to set the pace while the other(s) sit back, saving energy for a late race surge to (hopefully) victory. This kind of tactic has been employed most famously in 1500 meter races. You may see some team tactics at the European Championships in Barcelona, July 26 – August 1. The event that appears most likely to have team tactics is the men’s 1500 on Friday, July 30. This event appears to be a showdown between Britain and Spain. Britain has the top two entries in Andy Baddeley and Tom Lancashire, as well as Colin McCourt. The home country, Spain, boasts Manuel Olmedo, Arturo Casado, and Reyes Estévez. The women’s 1500 final on Sunday, August 1 could also have multiple athletes from the same country, and whenever there are multiple athletes from the same country there is opportunity for team tactics to take place. The Spaniards have Natalia Rodríguez and Nuria Fernández so they may try some team tactics to win a gold medal in front of the home crowd. The British have a formidable trio of Lisa Dobriskey, Stephanie Twell, and Hannah England. But the country to keep an eye on is Russia because they are famous for employing team tactics (see below) and may decide to do something to help Anna Alminova win the race. In the 1968 Olympics, the Kenyans ran team tactics to help Kip Keino defeat the heavily favored Jim Ryun. Ryun was, at the time, the world record holder in the mile and the 1500 meters. But the race was at altitude in Mexico City and Keino’s teammate Ben Jipcho was willing to sacrifice himself to help Keino beat Ryun. Jipcho and Keino had a strategy to run a fast pace to weaken Ryun’s deadly kick. Jipcho, with Kieno on his shoulder passed 400 meters in fifty-six seconds. Ryun ran in third place but was well behind. Most people watching thought this pace was too fast given the altitude. But Keino pushed on, taking the lead at 800 and maintaining a world record pace after three laps. Ryun was now too far behind and the race was over as Keino held on over the last lap to win in 3:34.91, a time considered impossible in Mexico City’s thin air. Ryun earned the silver, twenty-five meters back while Jipcho would finish tenth. In the 2000 Olympics men’s 1500 the Moroccan team attempted to help Hicham El Guerrouj win gold by having teammate Youssef Baba lead the field through a fast first two laps. Baba did fine on lap one but slowed down too much on lap two, so that when El Guerrouj took the lead after 800 meters the split was slower than anticipated. El Guerrouj battled to the end but was outsprinted by Noah Ngeny, losing by 0.25 seconds to Ngeny’s 3:32.07. Maybe if Baba, who faded to last place more than ten seconds behind second to last place, could have maintained a faster pace on lap two El Guerrouj would have won. In the 2005 World Championship women’s 1500 Russia, with four women qualified for the final, had the slowest of the four, Yelena Soboleva sacrifice herself by leading the race until there was less than a lap to go. This gave Russia their best chance at a 1-2-3 finish. The announcers in the video even talk about the Russian tactics. In the video (especially the slow motion replay) you can see how Bahrain’s Maryam Yusuf Jamal gets pushed around when she is surrounded by the four Russian runners on the backstretch. Russia did get the first three runners (Tatyana Tomashova,Yuliya Chizhenko, and Olga Yegorova) across the finish line with the pace setter Soboleva placing fifth. After a protest however, Chizhenko was disqualified for obstructing Jamal and Russia had to settle for first, second, and fourth. Team tactics are not limited to the 1,500 meters. The Kenyan runners have been doing it for years in the steeplechase. One of the more famous instances of the Kenyans running team tactics in the steeplechase occurred at the 2004 Olympics. The Kenyan athletes were Ezekiel Kemboi, Brimin Kipruto, and Paul Kipsiele Koech. The only other legitimate medal contender was Musa Obaid Amer from Qatar. The Kenyans were motivated by more than just medals to defeat Amer, a former Kenyan athlete who one year earlier defected to Qatar. When he ran for Kenya he was known as Moses Kipchirchir. It was somewhat personal. During the race, the Kenyans definitely kept an eye on Amer so they would know where he was. On the final water jump they got in front of Amer and blocked him, causing him to have to slow down slightly. I don’t have video footage to see how close it was to a disqualification for impeding another athlete, but no foul was a called by the officials and Kenya went on to sweep the medals leaving Amer medal-less in fourth place. 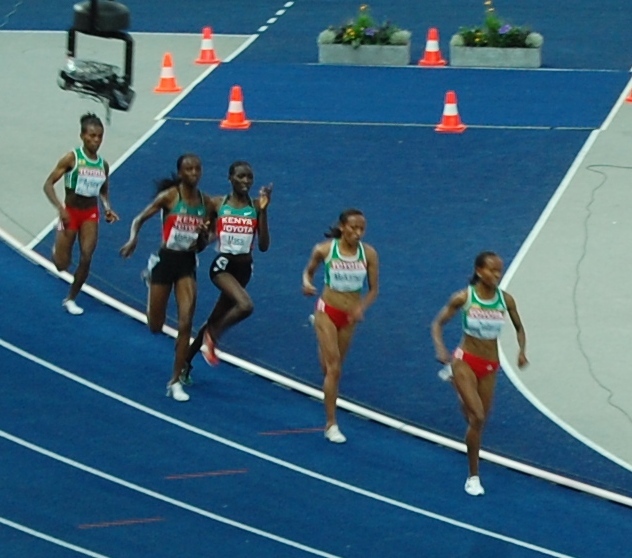 At the 2009 World Championships, Kenyan runners used team tactics in the women’s 10,000 meter race. Their plan was to set-up Linet Masai to defeat her rivals from Ethiopia, Meseret Defar and Tirunesh Dibaba. Ricky Simms, Masai’s agent and advisor said in a Runnng Times story, “Our plan in the 10,000 meters was to make the race honest in the second half. Linet and Grace Momanyi worked together and took turns pushing the pace. Our aim was to take away some of Defar’s speed on the last lap.” It worked. Although Ethiopians would finish second, third, and fifth, the Kenyans considered it a success because Masai brought home the gold medal. One week later in the 5,000 meters Kenyans Vivian Cheriyot and Sylvia Kibet worked the same strategy to run the kick out of the Ethiopians. This time they were even more successful, with Kenyan winning gold and silver ahead of the Ethiopians. Team tactics seem to occur less by USA athletes. I think it is because American athletes have been conditioned to make decisions that are in their best personal interest, which may not be what’s best for the country’s success in a race. In a country like Kenya, the head of athletics has the power to dictate the race tactics to all of the Kenyan runners in a race. It is my understanding that there is usually just one person at the top and out of respect for that person, loyalty to their country and the threat that they will be punished if they do not carry out the race plan, the Kenyans follow their directions. In the USA, any discussion of team tactics would need to involve the athlete, their coach, their agent, and their sponsors. Who would decide the tactics? Who would the race be set-up for? What motivation does an athlete have to follow the race plan if the race is not being set-up for them? These other considerations make it more difficult for the USA to employ team tactics. Next time you watch championship races, whether it’s the European Championships next week in Barcelona, the NCAA Championships, the World Championships, or the Olympics, keep an eye out for all the different tactics that are taking place.